This is a picture of the angler who caught the first Springer on Tweed on the opening day of the season, 1st February, 2012. 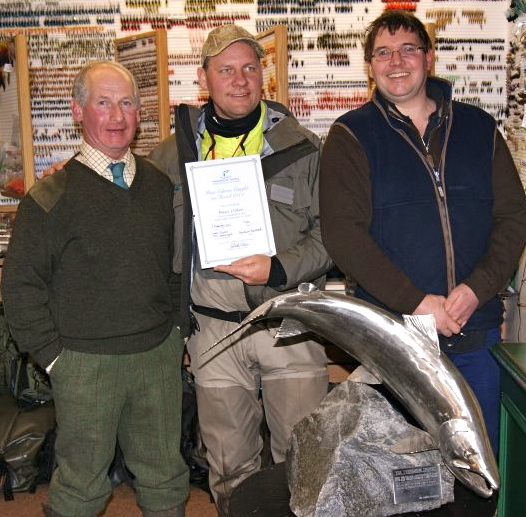 From left to right are; Jim Smail (Head Boatman on Lower Floors), Magnus Klintheim and Tim Pilcher of Tweedside Tackle. Angler – Magnus Klintheim from Sweden, first ever trip to Scotland! Time – 9.30am first catch on the whistle blow! There were well in excess of 30 fish caught on the system on the opening day. By far the best opening day in a decade! Final tally still to be confirmed. If you have any photographs and stories please email info@fishtweed.co.uk. This entry was posted in Uncategorized and tagged boatmen, FishTweed, salmon, spring salmon, Tweed. Bookmark the permalink.